Fettuccine is one of my favourite pastas. It’s wide and long enough to be drenched in any delicious sauce, and it’s also a very presentable pasta, if that’s a thing. Macaroni and cheese, not so fancy, put the same sauce on some fettuccine and you got yourself a restaurant dinner! In a pan prepare your chicken with some salt, black pepper, and butter. Cook on both sides till golden brown then set aside. In the same pan add the cream and seasonings, mix and let the cream come to a simmer. Then add the crushed tomatoes (I use marinara if i’m out of tomatoes and it tastes delicious!) and the cheese. Taste the sauce to see if it needs to be seasoned and add salt and spices according to your taste if needed. Once the cheese has melted toss in the boiled fettuccine and mix until every noodle is coated. Then pour out the fettuccine into a serving dish. 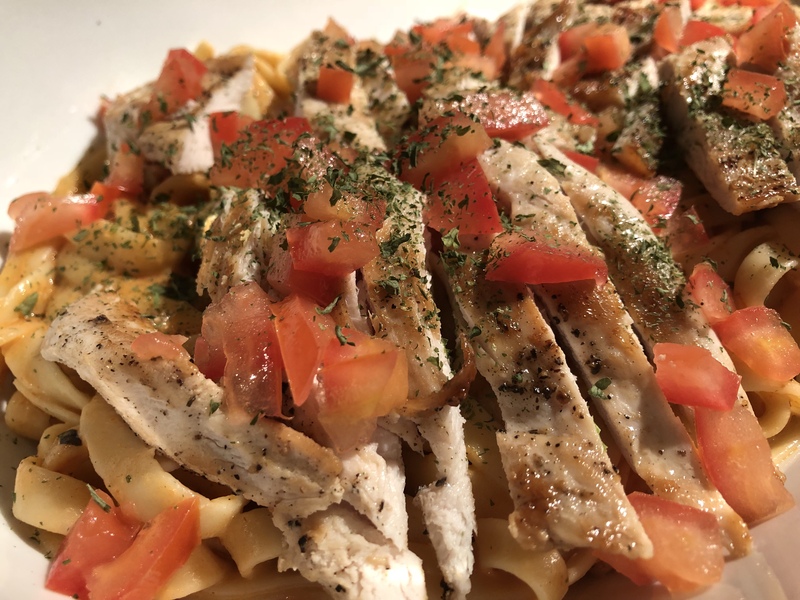 Cut the chicken into strips and place it over the pasta. Sprinkle over the chopped tomatoes and basil and serve immediately!